Some actors spend hours in the makeup chair and the wardrobe department getting just the right combination of latex noses, fat pads, wigs and other elements of disguise to successfully pull off the transformation from movie star to the character they’re playing in a biopic. 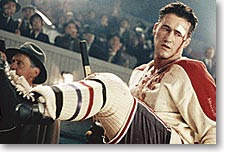 However, when it came to the role of legendary hockey player Maurice Richard who heroically helped his team win five back-to-back Stanley Cup championships in Charles Biname’s multiple Genie award winning Canadian film, actor Roy Dupuis was the naturally perfect choice to play the man whom he uncannily resembles. In this inventively shot period film, cinematographer Pierre Gill captures the look of Depression-era Quebec by punctuating certain colors (blues, maroons and greens) in this finely crafted and visually stunning work that tells the story of the French-Canadian hockey player who must overcome the overwhelming prejudice against himself and other French speaking players by referees, coaches and other NHL players who sometimes shockingly encouraged one another to take down the impressive skater. An eye-opening look at racism and competition, the blood and gore evidenced in the fast paced hockey match recreations is definitely not for the squeamish but it’s a moving and fascinating story about equal rights that not only I was unfamiliar with but is not usually the subject matter of most “underdog” sports films. One of the bigger hits at the 2007 Scottsdale Film Festival that had some audience members returning to see the film again benefits largely from leading man Dupuis who turns in a moving performance that earned him the Best Actor Award from the Tokyo International Film Festival.